Asus has announced a 'dual intelligent' motherboard, which the components giant claims brings the 'perfect harmony of high performance and energy savings'. The new approach to motherboard design features two intelligent co-processors which control system optimisation. Asus believes that this offers an 'effective way to get more out of existing PC hardware'. 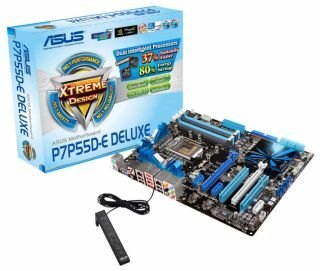 "The co-processors address the two prime issues behind PC hardware evolution-performance and energy efficiency," explains Asus. "As CPU makers strive to reach ever higher core counts and 32nm fabrication, this technology from ASUS promotes system optimisation, utilising smart design to enable performance while at the same time saving energy." Paired with the energy processing unit (EPU), the TurboV Processing unit (TPU) relives some of the stress on the CPU when things get intense. "Delivering amazing performance requires considerable finesse, especially in a user-friendly manner. ASUS TPU technology makes that possible," said Joe Hsieh, General Manager of the ASUS Motherboard Business Unit. "While manual system tuning calls for expertise and has too many variables that can go wrong, the TPU helps users gain hassle-free improvements so they can enjoy and do more on their PCs."